Doors open at 1 p.m. and games (two cards at a time) are FREE. Coffee, snacks and prizes are also provided at no charge. 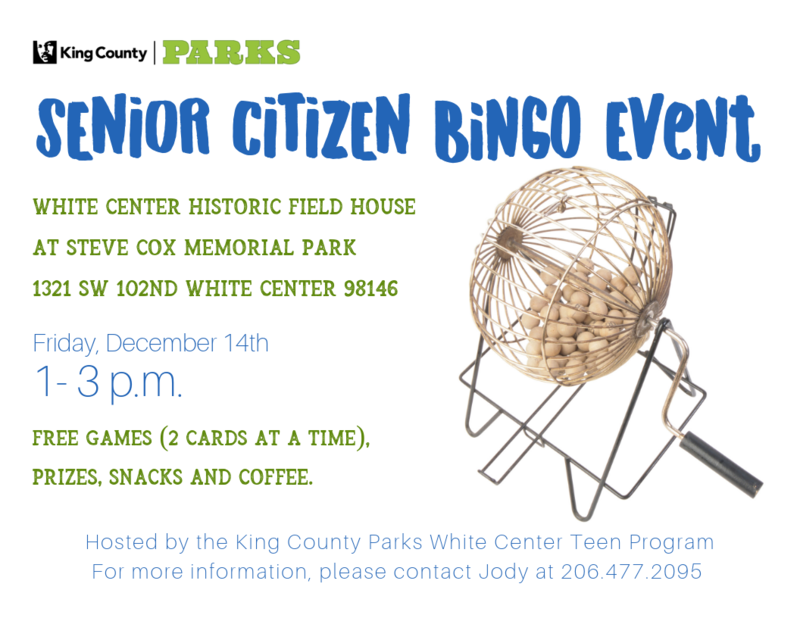 Teen volunteers will be on hand to assist with calling the Bingo Games. All White Center Senior Citizens are invited to attend. The fieldhouse, which is also known as the White Center Community Center, or the Log Cabin, was constructed between 1938 to 1940 and is one of the five original Works Progress Administration fieldhouses in King County. Designed in the National Park Service “rustic style,” the fieldhouse features gabled wood shingle roofs, large covered porches with oversized log support posts, stone fireplaces, and half-log sliding. The building is a designated King County Landmark as well as a designated National Landmark.